Students are working in pairs to design, build, and test a hand pollinator for a model of a specific flower utilizing the results of tests they conducted to determine which materials were best at picking up and dropping off pollen. Children are using their knowledge of pollination, materials and their properties, and the Engineering Design Process to design and improve their hand pollinator for their model flower. This week's Monday Mélange was about the Jewish celebration called Hanukkah. A River parent and student (pictured above) shared about the history and traditions of Hanukkah. We learned about the miracle of the oil, the lighting of the Menorah, the symbols on the dreidel, the various spellings of Hanukkah, the direction of Hebrew writing (right to left), and why latkes are eaten during this time of celebration. We learned about the Hebrew symbols and meanings. We feasted on delicious potato latkes. 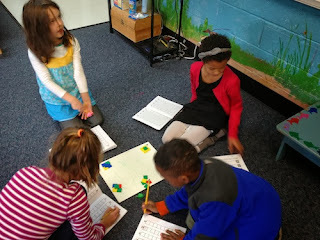 This week's math lesson was focused around the game of Dreidel. 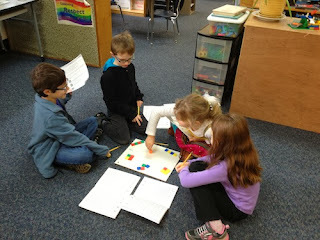 Children worked collaboratively in groups to play the game of Dreidel and to record their spins. We learned about the various dreidel symbols of gimel, hay, shin, and nun. Children then had to guess which symbol would appear the most times. First, the children played the game in order to become familiar with the various symbols on their dreidels. Secondly, River students began to record their game in their math books by means of a bar graph. The team members of each group worked together to ensure that they all had the same results. We ended the activity by tallying up the results from each group.